Winter can mean different things to different Can-Am® owners, depending on where they live. For those in the Desert Southwest of the United States, it means sand dune season and more riding. But for those owners in the northern climates, it is typically characterized by snow, frozen lakes and up to four months of brutally cold weather. Often, time is better spent behind the window pane of a warm cabin rather than romping outside smack dab in the white-out and wind chills. Some choose to park their favorite Can-Am ATV and SSV until the harsh, freezing time passes, but with the introduction of the Apache Backcountry track kit, and all the sure-footedness that it delivers, that’s no longer necessary. Now owners can warm their feet by the fire after they journey off the beaten path or put in a good day’s work floating over the snow rather than trying to trudge through it. The no compromises Apache Backcountry Track Kit is made specifically for snow and all its varying forms, from deep snow pack to fresh powder to carving through mountainous terrain. The Apache Backcountry Track Kit is now available in Can-Am dealerships and includes a two-year warranty and free installation! 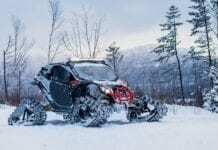 The kit has also expanded to include the 2019 Outlander and Renegade ATVs and the Maverick Sport family of side-by-side vehicles, making it easier to get out an enjoy this fourth season, one that can be as beautiful as it is abominable. Traditional four-season tracks can sacrifice performance in snowy conditions in order to improve all-around performance. The Apache Backcountry kit was designed to elevate performance in the snow, blending BRP’s renowned Ski-Doo®snowmobile and existing-and-proven innovative Apache 360 Track System technologies to create the industry’s most sophisticated Can-Am snow track kit. Designed exclusively by Can-Am for Can-Am off-road vehicles. This means the Apache track kits are built around Can-Am vehicles and nothing else, so no shortcuts or compromises were made. 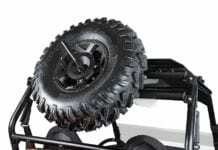 The high-quality Apache family of track systems includes the built-for-snow Apache Backcountry track kit and the four-season Apache 360 and 360 LT kits. All the track kits are engineered from the Can-Am factory for perfect fitment, seamless integration and premier functionality. 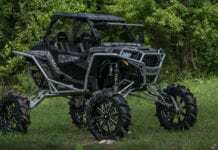 The Apache Backcountry kit is built to optimally match engine output and support chassis performance while also delivering maximum performance without jeopardizing the vehicle or the track’s durability. The ultra-rugged system includes an innovative DPS module that intelligently ensures speedometer accuracy and also optimizes track assist for ease of steering and precision control. 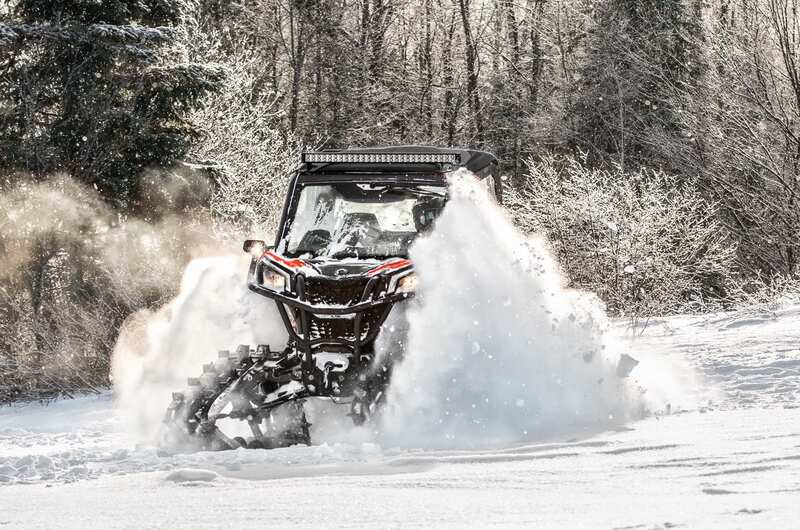 Hours of engineering, in-field research and product development advancements have created the purpose-built Apache Backcountry track system, which features leading-edge snow technology. While the Apache 360 LT kit is capable in the snow and adapted for four-season use, it’s the Apache Backcountry track kit that is the most complete and dedicated product to help you achieve your winter endeavors. Aggressive track and industry-leading design: Large 2-in. lug height and 3-in. pitch for maximum traction in deep snow. Optimized gear ratio: 17-tooth sprocket with large 3” pitch delivers 7% more speed than the Apache 360s, resulting in better performance in deep snow. External drive system ensures slip-free riding and maximum power transfer. The enclosed anti-rotation arm improves control and performance with an integrated adjustable pre-load spring and multiple rubber dampers. Offers a lower rolling resistance than the competition, allowing for a more efficient transfer of horsepower to the ground. Curved front rail improves steering ease. Optional idler wheels and sliders with Vespel inserts increase slider lifespan in harder snow conditions. 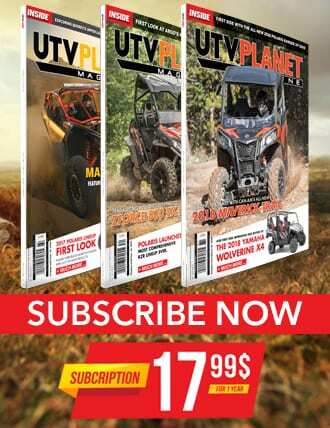 $5,349.99: Maverick Sport / Maverick Trail (715005247); 2019 Outlander and Renegade ATV (except 6×6 models). 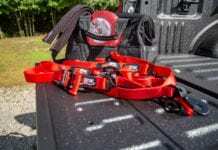 Mounting kit required for all vehicles: $649.99: 2019 Maverick Sport / 2018-2019 Maverick Trail (715004285); $524.99: 2019 Outlander and Renegade ATVs (715004796). For 2018 ATVs and prior, check the fitment guide here. Also, check out the online Can-Am store or your local Can-Am dealer for more accessories and apparel. 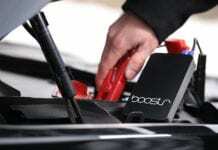 A Mini Jump Starter, Is It Worth It?